When a couple separates both mother and father have a financial responsibility for their children’s wellbeing. Before you separate, you can apply to the Child Support Agency or come to a voluntary agreement with your partner. You should consult a solicitor on the options for your situation. A married couple both have parental responsibility for their children when they separate. If they are unmarried, and the fathers name is on the birth certificate then both parents have perental responsibility, if the fathers name is not then only the mother has parental responsibility. Whether or not the father has parental responsibility, he is still financially responsible for his children’s welfare. A father can acquire parental responsibility if he has signed the child’s birth certificate, if both partners sign a Parental Responsibility Agreement, or he can be awarded parental responsibility by a court. When you separate you can come to an informal agreement about maintenance payments, or have the agreement made into a court order as part of your divorce. As with the division of property and assets, the court will seek a fair outcome based on the needs of the children and the resources of both partners. They will also consider how much the Child Support Agency would calculate if it were coming to a decision. Unless a parent is on a low income or receiving benefits, the Child Support Agency stipulates they have to pay 15% of their net income towards the care of the child to the parent the child lives with. For two children they pay 20% and for three children 25%. Net income is defined as any normal earnings after tax and National Insurance. 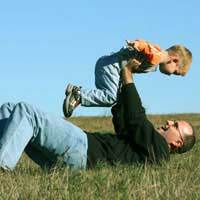 If you are receiving state benefits the Child Support Agency usually has jurisdiction. Therefore they will decide how much is to be paid by the non-resident parent. If you apply for benefits on separation, the CSA automatically becomes involved. Visitation and maintenance payment are often linked, with a parent paying less the more time they spend with their children. Reductions are made if the children spend more than 52 nights a year with the absent parent, with further cuts made at two and three nights in a week. An absent parent earning less than £200 per week pays a reduced rate. If they are earning less than £100 per week the percentage of net income is reduced further. If they are on benefits they pay a flat rate of £5 per week. Reductions are also made if the absent parent has to care for step children in a new home. The net income figure is reduced by 15%, 20% and 25% respectively for three step children in a new home. When child maintenance is calculated, the CSA does not take into account net income above £2,000 per week. This means that the maximum amount payable would be from £225 up to £500 depending on the circumstances. It is not advisable to attempt to delay a maintenance decision by failing to provide the information requested. The CSA has wide powers and can levy a provisional maintenance amount that can be higher than a normal calculation. They can also add a 25% penalty for late payments or if a person refuses to pay. Legislation is also currently being considered whereby the CSA can order bailiffs to seize the possessions of a partner who has not kept up their payments. A child maintenance payment has been agreed on a voluntary basis.However if the sum agreed is later shown to be insuffient can this be reviewed with a view of increasing the payment.